When I was eight, I read a children’s bible book that I found in my grandmother’s small library. It had all the usual stories: Adam and Eve, Noah’s Ark, David and Goliath and the one that shocked me the most, Lot and his pillar-of salt wife. It seemed god was having daily chats with these folks, telling them what to do, where to go, intervening in their mundane lives. I asked my grandmother why god no longer spoke to us the way he did to random people in the old testament. She was unsure as how to reply, finally she said “things were different then.” I found that answer unsatisfactory. Around the same time, I ordered a book from school on the ancient Egyptians. The symbolism, the artifacts in the picture book called to me in a strange nostalgic way, in a familiar way. Also in my grandmother’s library was an adult mystery revolving around Egyptian mythology, on the cover was a blond woman running from a giant Ra, her head turned to view the threat behind her. While my eight year old brain found the plot confusing and abstract, the passages involving Egyptian gods and mythology resonated in a way the bible book didn’t. I was ready to leave my old silent bible god behind. At eight years old I wanted to worship at the altar of Isis. I eventually gave up all gods but I’m still drawn to Egypt in an inexplicable way. The iconography always catches my eye and when I look through some of those picture books, I still feel the same pangs of nostalgia and knowing. But mostly, it’s the music from Egypt that I love. The above video is from the brilliant movie Latcho Drom. The rhythm of this Egyptian Romani* music hums into my bones and pulses in my marrow. It reverberates down at the DNA level. More on Gypsies in Egypt here. 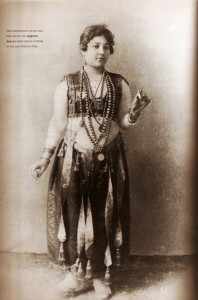 Egyptian Romani dancing is called Ghawazee. The word “Gypsy” comes from the mistaken European belief that Gypsies originated in Egypt. Gypsies or Romani, as is the preferred term are originally from Northern India. See the film Latcho Drom for a musical tour of the Roma diaspora.